One unique avatar, stepping from one virtual world to another. This was the idea and weblin made it come true. The new weblin Gate portal allows avatars to roam from the virtual world of Second Life(R) to the Web, which is the biggest virtual world. Isn´t it? Yesterday, at 8:00 am Boston time we sent out the press release and just few hours later, there was a bunch of people waiting in the weblin house in SL, to be teleported to the web. How cool is that? If you are a SL user try it. -- The Weblin house in Second Life is located in New Berlin, close to the tower at Alexanderplatz: New Berlin 221, 73, 32 (PG). 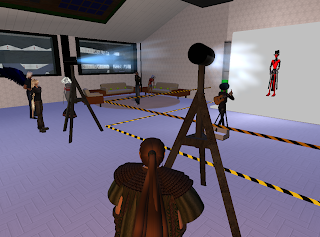 -- The Second Life avatar is capable of performing all the actions of a weblin avatar, such as walking left and right, dancing, laughing or waving. -- The 3D data is then exported as a library of animated GIFs and once the conversion is finished, the user receives a link and is directed to a personalized weblin login landing page, built with a token. With the token, the generated library can be mapped to one's weblin account. -- Interoperability between virtual worlds is something Linden Lab actively supports. This is a positive and encouraging development for Second Life users to add more dimension to our user experience. There are already a lot of blog posts covering weblin Gate. One of the posts I liked best for now ist: Common|Sensible.